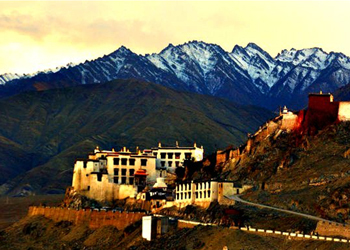 Spituk Monastery is a Buddhist monastery around 8 km away from Leh and is also known as Spituk Gompa or Pethup Gompa. Founded by Od-de, it dates back to 11th Century. Initially, the spituk monastery was founded as Red Hat Moanstic institution but later it was taken over by the Gelugpa (Yellow Hat) order in 15th century. Inside the spituk monastery, you get to see several images and statues of Lord Buddha. There is a sacred idol of Amitayus (samboghakaya form of Amitabha). Further, the Dukhang (assembly hall) of the monastery possess numerous collections of thangkas (a painting on cotton or silk, depicting Buddhist deity), masks and antique arms. The spituk monastery has 100 monks and a giant statue of Hindu deity Kali, which is unveiled during the annual Spituk festival. Gustor is a two day spiritual festival organized on 17th and 19th day of 11th Month of the Buddhist calendar with elaborate dance rituals performed with great fervor. The local population takes active part and is joined by monks and students staying in the monastery.